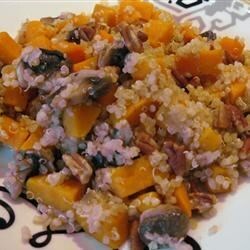 "Sweet Potato, onion, mushrooms, and chopped pecans are served over a bed of quinoa. This dish is perfect as a warm meal or side dish during cold weather." Learn how to make sweet potato puff topped with crunchy pralines. Wonderful! My first time trying quinoa and I really enjoyed this. I did add a sprinkle of pumpkin pie spice. I will definitely make this again!